Today, unknown assailants have attacked two outspoken critics of Wahhabi/Salafist Islam in Kazan, capital of the Russian republic of Tatarstan. 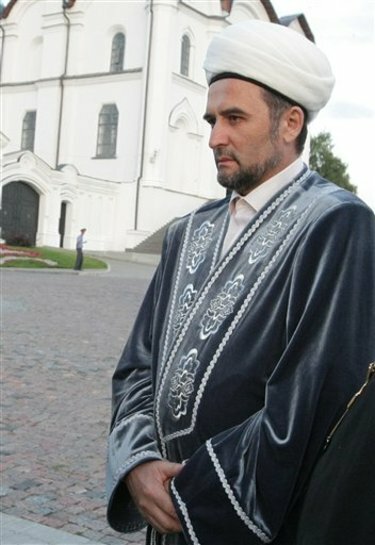 Valiulla Yakupov, Tatarstan’s Deputy Mufti, was shot and killed as he left his home, whilst elsewhere in the city the Chief Mufti himself - Ildus Fayzov – was seriously injured as a car bomb tore his vehicle apart. Although nobody has yet claimed responsibility for these attacks, it is a near certainty that they were perpetrated by Salafist militants, angered by the efforts of these two men to combat a growing trend towards Quranic literalism and the call for violent Jihad that has been gaining traction in the republic. It seems symbolic that the attacks took place upon the eve of Ramadan, as if emphasising that the attackers regarded them as false Muslims. There thus seems to be a clear motive for the attacks, with the Islamists wishing to use violence to silence those who advocate a peaceful interpretation of Islam, with a view to further radicalising and polarising the situation within Tatarstan. However, although Yakupov and many others have made reference to a very real foreign role in generating this phenomenon, there is also the Caucasus to take into consideration, which has acted as an incubator for Salafist radicalism these past two decades. Self-styled ‘Emir’ Doku Umarov has been attempting to create what he terms a “Caucasian Emirate” and, according to Nezavisimaia gazeta, has also called for “mujahideen” to “resettle in the Volga region so as to call local Muslims to jihad.” The Chechen Islamist also wishes for Tatarstan to secede from Russia and to become part of a “Greater Caucasian Emirate”. Such people are said to have settled in Tatarstan and are playing an active role in pushing Salafism, with the consequence that experts now believe that no less than 10 of Kazan’s 50 mosques now effectively lie in their hands. As outlined on this blog last year, officials in Tatarstan have grown increasingly worried about the growth of violent Islamist militancy for quite some time, as reflected in a piece on the republic run by Nezavisimaia gazeta entitled ‘A whole Generation of Extremists’, for it is amongst the younger generation in particular that Salafism is exerting the greatest appeal. This revealed that a considerable number of individuals had visited Pakistan and Afghanistan where they participated in violent jihadist activity before returning home with a view of attacking domestic targets. Although Tatarstan as of 2010 had a population of 3.8 million, of which only 53.2% were Tatars (traditionally Sunni Muslims), experts consider that there are no less than 3,000 Islamist radicals in the republic, of which approximately 10% are “ready to take up arms and wage jihad, and the remainder to sponsor and help them in any way”. This figure is roughly equivalent to the number of Islamist radicals reputedly being monitored in the UK. For a territory as small as Tatarstan, this figure is quite remarkable, and today’s killings are not the first that have been perpetrated by jihadists on its soil. In November 2010, three Islamist militants believed to have planted a bomb beneath the car belonging to the Director of Tatarstan’s branch of the Ministry of Internal Affairs (MVD) Centre for Countering Extremism, were tracked down and killed in Nurlat’skii District. In the five-year period leading up to 2011, more than 100 people in Tatarstan had been sentenced for their involvement in terrorist and extremist activity. Whereas in the past the version of Islam encountered amongst the Tatars has been of a relatively mild variety, the example of the effective displacement of traditional Sufism and other forms of Islam by Salafism in the Caucasus, seems unfortunately to point the way forward for Tatarstan, where young Muslims have increasingly taken to mimicking the fashions of the militants from the Caucasus, so much so, that many young Tatar nationalists have erroneously appropriated this alien cultural form as a signifier of their identity. Although therefore Kazan may lie far away and be practically unknown to most of us, this particular problem, born ultimately of Saudi oil wealth, is one shared with many other countries. Today’s attacks provide a sad and salutary reminder, that the malign influence of Salafist ideology is not yet on the wane, but rather, very much on the offensive and making significant inroads. Interesting, i'd heard of the Tatars but did'nt realise they had some land. The Wikipedia page has some background info. Hmmmmmn - radicals going abroad and returned more radicalised - sounds familiar! Oh yes, they have been there for a long time. In fact, this year marks the 460th anniversary of their incorporation into imperial Russia by Ivan the Terrible upon his conquest of the Khanate of Kazan in 1552. Their homeland is therefore wholly located within the Russian Federation. As for the comment about radicals going abroad and returning home, it does have a rather familiar ring doesn't it?